Potato and Egg Stuffed Peppers are my new favorite way of baking eggs for breakfast. Well, not just in the morning but any time of the day. 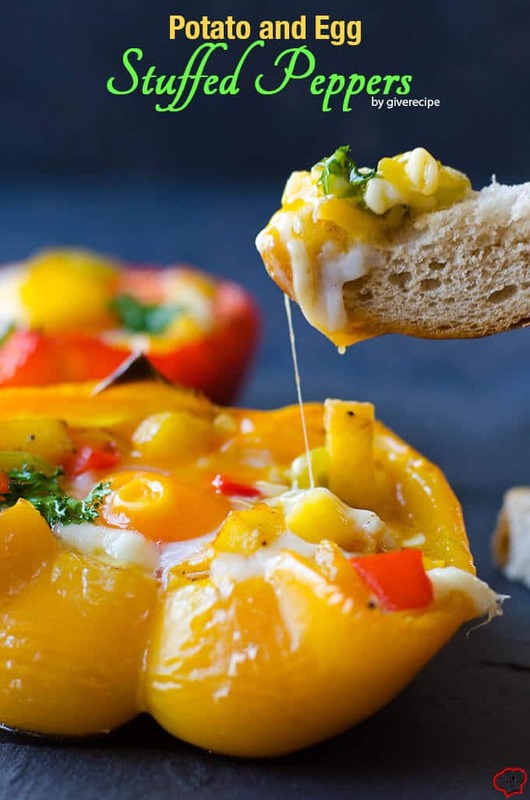 We love breakfast for dinner, so we sometimes have these for dinner in the concept of breakfast, which means we pair these flavors packed peppers with newly brewed tea, extra cheese and a simple salad with tomatoes and cucumber. You know what a typical Turkish breakfast calls for. 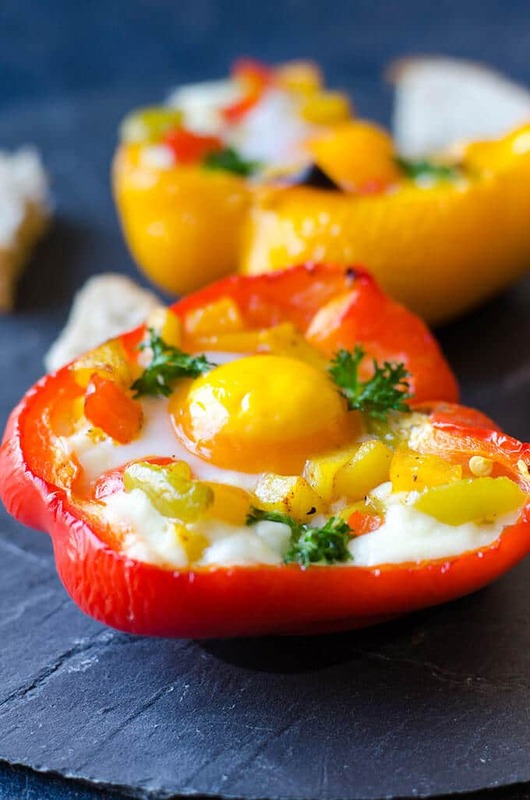 While we love Egg Stuffed Tomatoes, these Potato and Egg Stuffed Peppers make everything even more special. 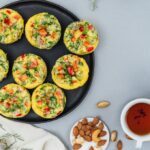 These are quite satisfying as I used sauteed potatoes and peppers as the filling before topping them with eggs and mozzarella. 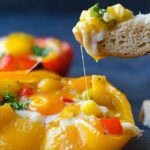 I’d been planning to make these for a long time with green bell peppers as those colorful peppers are not so common here. So I didn’t think twice when I saw red and yellow bell peppers at a market here. I had several recipes in my mind as I was coming back to home with the market bags. Potato and Egg Stuffed Peppers won the game in my mind. I first baked the halved peppers in oven for about 20 minutes over 400F. Meanwhile, I prepared the filling. Slightly fry diced potatoes and a mixture of green, yellow and red peppers together. When the peppers are done, which means they are slightly tender, fill them with the mixture of fried potatoes and peppers leaving a hallow for eggs. Break egg into a small bowl and carefully pour it into the pepper. Repeat this for each pepper and egg. Be careful not to overflow eggs. 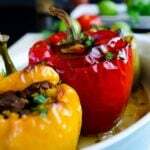 Top each stuffed pepper with grated mozzarella and bake for about 15 minutes or until the egg whites are set. 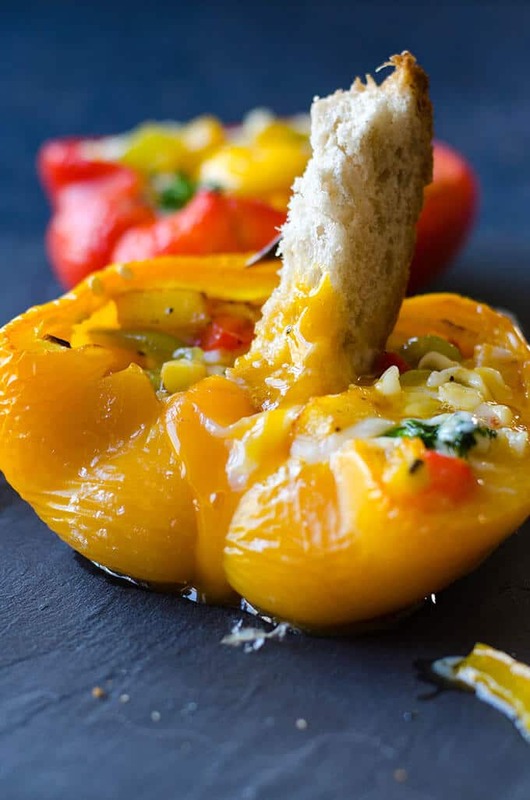 If you have any leftover filling, just serve it along with the stuffed peppers. Potato and Egg Stuffed Peppers are wonderful when hot, but I do love them cold too. If you prefer heating up the leftovers, put a little oil or butter in a pan, place stuffed peppers and heat them covered over medium low heat. You can even add a little tomato sauce in the pan to avoid any burning and this becomes a completely new recipe. 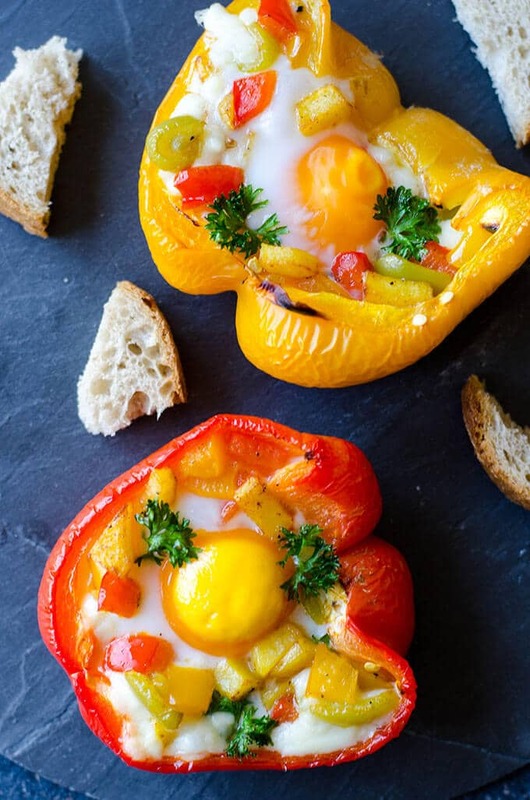 Very satisfying peppers stuffed with fried potatoes, peppers, egg and mozzarella. Line a baking pan with parchment paper. Cut peppers in half, remove ribs and seeds. Sprinkle salt inside them and place them cut side up in the pan. Bake for about 20 minutes until almost tender. Meanwhile you can prepare the filling. Heat oil in a medium pan and fry potatoes and diced peppers. Transfer them on a paper towel and season with salt. Stuff peppers with the filling, leaving a hallow for eggs. Break one egg in a small bowl, pour it carefully into pepper. 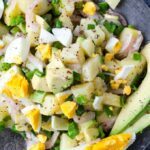 Repeat this for other eggs and peppers. Top with grated mozzarella and parsley. Bake for another 15 minutes or until the egg whites set. Oh my g! This is very unique; I am literally amazed with this kind. Imagine an egg inside bell pepper! 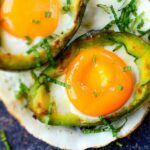 So bright =) I am sure my sons will be encourage to eat eggs if I prepare this, since the only eggs they eat is stockton’s scotch eggs! wow! this looks amazing, a recipe completely suiting my taste. I am definitely cooking this.